A vivacious scent inspired by the heart of nature, Giorgio Armani Acqua Di Gioia Eau de Toilette opens with accords of Primofiore lemon and black currant, mixed with fresh pear and violet leaves. The heart is fresh, silky and airy, made of peony and two types of jasmine (crystal and sensual Sambac jasmine). The base notes include cedar wood and cashmere, as well as sweet accord of brown sugar. 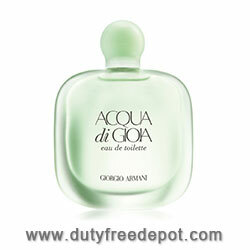 Meaning Water of Joy" in Italian, Giorgio Armani Acqua Di Gioia is an ode to to the infinite joys of life.